The treatment of eating disorders has grown tremendously over the last decade, but may still be considered by some to be a relatively new field, established about 30 years ago. 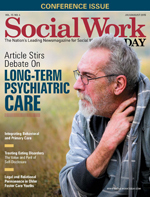 It's become popular with social work professionals, and I had the unique privilege of taking part in this specialization when I began practicing fresh out of social work school in the mid-1980s. I had recovered from an 11-year struggle, from the ages of 12 to 23, with anorexia nervosa and then bulimia nervosa. Early on in my professional life I was eager to share my story in an attempt to educate others about eating disorders. As I entered the field, I quickly learned that other professionals frowned upon sharing this personal information and I ran the risk of being taken less seriously. As my peers understood more about the etiology of eating disorders, exposing myself in this way usually meant opening myself up to a higher level of scrutiny. It felt dangerous to be "out" and those of us who were recovered would more likely choose to go underground with this personal information. As time went on, eating disorders became better understood and represented in mainstream media. There was less of a stigma attached as more people with eating disorders sought treatment and therapists began specializing in the field as hospitals and residential treatment centers began cropping up across the United States. Some courageous individuals began "coming out of the closet" and advertised themselves as recovered professionals. The field is still attempting to figure out how to manage this challenge with more professionals exposing themselves as having recovered from an eating disorder. There's even a special interest group in the Academy of Eating Disorders for recovered professionals. The critical question persists of how to use personal information in any clinical treatment. A therapist's personal story can be helpful to one client and potentially difficult, if not harmful, to another, so the management of these facts becomes key. I've learned over the course of my own practice to give out these data with great care and consciousness of the individual. One recent interesting challenge for me has come with the advent of social media. Increasingly, clients Google me and do their research before deciding to come in. Because of my public speaking and publications, they can easily find out that I'm recovered before I have a chance to decide if and when I might choose to tell them my history. How I respond to a client having this knowledge is also important. On one hand, I know that they're comfortable with it as they've chosen to come to me, but that doesn't mean they're interested in more discussion about it or in any additional details. If clients tell me that they know I'm recovered, my response lets them know that I'm solid and comfortable with this part of my history and their knowledge of it. What I consider to be "fully recovered" from an eating disorder may also be different from someone else's experience, as I believe the definition of recovery to be somewhat subjective. I use the phrase because I know it to be true. But the concept of recovery is complicated, especially to someone in the throes of the disease. The National Eating Disorders Association also takes the position that eating disorders are fully treatable and successful full recovery is achievable. Still, the concept of full recovery varies. I believe it includes not only the cessation of disordered eating behaviors and weight restoration or stabilization, but also the resolution of an eating disorder mindset. All of these issues are sticky to say the least. I feel strongly that recovered therapists serve as role models of what recovery can look like. Clients can be reassured that if we can do it, they can too, at a time when it might be hard for the clients and their families to imagine. So how we look actually becomes important. I often see therapists who call themselves recovered who are clearly still underweight or overexercising. That always worries me. Of course, they have the right to their own comfort level, relationship with their bodies, and personal definition of recovery. But it's also uniquely challenging in this field because clients scrutinize our appearance. We have to be really comfortable in our bodies because they note and judge everything about us, including our weight and how we look and carry ourselves. This may be true in any psychotherapy treatment, but especially with this population. So I believe that it's imperative for recovered clinicians choosing to work with this community to be truly at a healthy and fully recovered weight. I also encourage supervisors and those working with recovered eating disorder professionals to voice concerns about a clinician's state of recovery. Eating disorders are by nature very secretive and protective. It can be very difficult to challenge an employee or colleague who insists that he or she is recovered or in recovery when that person doesn't seem to be. A voice of reason has to be louder than the eating disorder voice. We have a responsibility to both clinicians and clients not to collude with a clinician's eating disorder. As for mindset, individuals who have eating disorders also have specific underlying issues and ways of thinking that both set the stage for development of an eating disorder and fuel an ongoing one. The mindset includes uniquely low self-esteem, extreme perfectionism, and self-consciousness, as well as an internal tyrannical drive. Full recovery must encompass relief from all of these conflicts and the development of a new and healthy relationship with self. Recovered professionals must understand these issues in order to help others who are suffering. We must know eating disorders inside and out as we attempt to help others. Ideally, I believe that professionals should be fully recovered before entering this field of specialization, although this isn't always possible. Also, those moving along their own journey of recovery can have great wisdom and perspective to offer clients. It's critical for clinicians practicing in this specialty as well as their supervisors to be keenly aware of these concerns. This is true in private practice as well as in eating disorder specialty treatment centers offering all levels of care. Our understanding of eating disorders, as well as our personal experience, can combine to make for outstanding clinical potential. Self-awareness is essential for responsible and successful practice. Sharing one's story of eating disorder illness and recovery presents many challenges. It can be very helpful to some, but it's important to carefully listen and assess what clients really want to know about your journey. I've made the mistake of sharing my story when a client wasn't really interested in hearing it; I sometimes offered it as a gift of sorts, but it wasn't always well received. I came to learn the importance of being well-attuned to a client's needs and wishes. It's important to be sharing one's story for the right reasons: It must be deemed beneficial to someone's treatment to have this information, otherwise it can be counterproductive or even problematic. The issues of transference and countertransference must be considered. How do we feel about the client? Why are we sharing our story? How does the client feel about us? How will sharing the story impact the treatment relationship? Most importantly, are we sharing the story for the right reasons? The right reason to share our story is to benefit the client, not us. Absent of this purpose, it isn't appropriate to share the information. Sometimes we want to share our story for our own reasons, thinking that the details of our experiences will help clients deal with a particular problem or situation. I've been surprised over my many years of practice at how uninterested some of my clients have been in these details. They may want to know that I recovered and that may in fact give me some credibility in their eyes, but they often don't ask many questions beyond that point. I've developed a way of speaking to the issue that's solid and finite which, I've learned, is often enough to satisfy the client's interest and curiosity. I am careful not to overshare. Sometimes, when we start telling our story, it can feel as though the genie has been let out of the bottle. It can take on a life of its own and we find ourselves intent on telling our story, like a runaway train. Once we start, it can be hard to stop. It can expose our feelings of vulnerability. It can also bring out our own narcissism and desire to speak about ourselves. It can stir up or play out competitive feelings with clients: Were we sicker than they are? Did we get better more quickly? How does their hearing our story make them feel? I've learned to be very conscious when I share any details about my story so as to remain attuned to the recipient's individual experience. We can inadvertently make our clients feel worse if we're not careful. The point to many of these clients isn't the how or the why. The point is that I'd been sick and now I'm completely recovered. Working with families as a recovered clinician can stir up specific countertransference and necessitates staying especially attuned to both yourself and the treatment dynamics. When working with families who have a loved one with an eating disorder, there are many issues to keep in mind. Parents, siblings, partners, children, and spouses are often desperate to find the right path to recovery. A family member may be particularly vulnerable when hearing a therapist's story of recovery. They may want the roadmap to success and are looking to you for the answer. It's essential to stress that what works for one person may not work for everyone. If appropriate, use your story as reason for hope or even as reinforcement for considering specialized treatment and ongoing psychotherapy. It's an opportunity to share facts about eating disorders and what we know about treatment and recovery. It may be applicable to share what was helpful to you when you were struggling. They may hear you, as someone who is recovered, as more of an authority. Still, be cautious as you tread these waters. Listen for what your clients and their family members are looking to find out from you as it applies to the person who is sick. Use the parts of your experience that are relevant to their situation or be honest if your experience doesn't apply. Always monitor how you are feeling as you let out this personal information and then measure how it's being received. Another issue to keep in mind is to never share potentially triggering details about an eating disorder experience. Never talk about numbers regarding weight or calories, time spent exercising, or specific eating disordered behaviors. Those struggling with an eating disorder are always searching for self-esteem, often in the form of comparing self to others, including how to "do better" at their own eating disorder. Hearing specific details about your eating disorder can make clients feel inadequate or give them ideas about what they should be doing—maybe you knew how to do it "better" than they did, so they take unintentional guidance from you. Any detail can be turned into a disordered to-do list for someone who is ill. We obviously never want to inadvertently, positively reinforce eating disorder thoughts or behaviors. Always err on the side of sharing less rather than more. There are some cases where clients want to know more about your experiences and continually ask you questions. Answer questions thoughtfully and ask about the client's ideas about you and your experience. This can be a great opportunity to talk about the client's feelings about you. I always want clients to feel comfortable about asking me anything. I certainly want to know what they're thinking. You can take time before answering any question, even taking time between sessions to gather yourself and consider your response. It's better to feel clear and internally organized than to feel pressured to answer when you're unprepared. Boundaries are a very significant issue for any individual or family dealing with an eating disorder. The body and food become the arena for control, symbolizing the ambivalence the client feels and wrestles with every moment about what is let in or kept out. It's especially important for the therapist to be sensitive to these issues. Good clinicians must always strive to model clear, healthy, and appropriate boundaries in treatment. Working in the field of eating disorders has been deeply gratifying for me. My years as a practicing professional as well as distance from my own eating disorder have made me better at treating this extremely challenging illness. Eating disorders are serious and pernicious, and defy logic and reason. Having the perspective of my own experience with the illness and hard-won recovery has definitely made me a better therapist with this population. I encourage anyone interested in this field to get specialized training and supervision. One's own experience only goes so far in making us up to the task. If you are recovered, you will probably need even more support for yourself as you become immersed in the work. Just as details can be triggering for clients, they can also be triggering for someone in recovery who is treating someone else. You can step away if you find yourself regressing with the exposure and pressure of working with this population. Taking the time between achieving your own recovery and beginning to practice to help others will help both you and the clients. As clinicians, our goal is full recovery for our clients, but first and foremost is full recovery for ourselves. We can't be the social workers and clinicians we want to be for others when we aren't well. Self-care is priority one. Maintaining that allows us to be the best we can be for the people who come to us for help, help that we may be uniquely qualified to offer. — Ilene V. Fishman, LCSW, ACSW, helped found the National Eating Disorders Association and is currently serving on its board of directors. She is in private practice in New York City and Montclair, New Jersey, and speaks widely on the subject of eating disorders.